A proposal to tax services like collision repair will be heard Wednesday by a California Senate committee. Senate Bill 8, sponsored by Democratic state Sen. Bob Hertzberg, a former Assembly speaker, will go before the Committee on Governance and Finance. 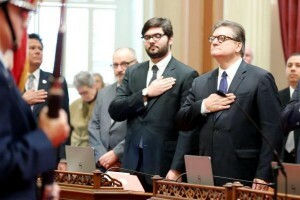 “Small businesses, like plumbing contractors, auto repair shops, and restaurants account for more than 90 percent of the state’s businesses and well over a third of all jobs” Hertzberg said in a January statement announcing the bill. “They are a key rung on the ladder of upward mobility. But they need a tax policy that will enable them to grow and add employees. Hertzberg said earlier this month that 80 percent of California economy is services, as does the bill. SB 8 would exempt health care and education services and any service provider who makes less than $100,000 a year. Conversely, it would also lower the tax rate for households making $100,000 or lower — to a max of $1,000 for $100,000. But none of the tax cuts would happen until there’s enough revenues coming in to cover it — which will create a fun little period where you pay the same higher income tax rate and new service taxes. The Board of Equalization studied the measure and found that at 8.42 percent, the service tax would bring in $122.6 billion, split more or less 50-50 between the city and local governments. Board members gave guarded statements about what they’d found. The panel did point out that the service tax will create logistics issues and could raise double-taxation issues for businesses who use one taxable service to deliver another to a customer. It also raised the question of items consumed to deliver a service — something certainly of interest to collision repairers — will that cause double-taxation if those tax costs are passed on to the end customer through a taxable service? Los Angeles Times coverage presented the bill more as a way to start a discussion about the tax system, and Republican Senate Minority Leader Bob Huff said he was looking forward to the debate. Be heard: California legislator contact information can be found here.